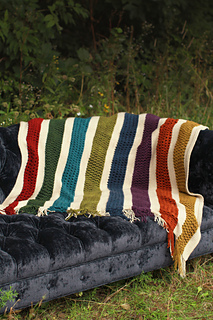 Our Hidden Falls Blanket is ready for you to choose colors and placements that reflect your taste. 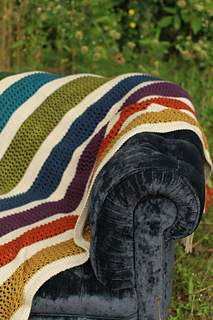 This blanket is the perfect place to mix it up with a bright rainbow of color bands or to quiet things down with a more monochromatic range of color. 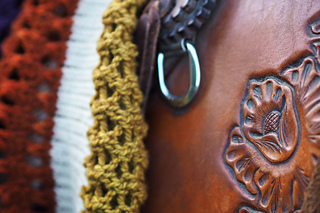 With alternating bands of stockinette stitch and a very simple lace pattern, the fringed ends are the final step in a unique finishing technique that uses the simplest steeking method imaginable! 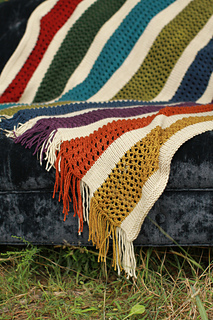 Hidden Falls Blanket will bring you hours of relaxed knitting and years of comfort!